Borcher was one of the top basketball coaches in Marshfield history and one of the best-known supporters of jazz music on the West Coast. He was a football and basketball standout at North Bend High School, graduating in 1937 and then played basketball for the University of Oregon before serving in the Navy from 1942 to 1946. He was Marshfield's head basketball coach from 1946 to 1951, winning the 1947 state title, and then was head coach at the University of Oregon from 1951 to 1956. During his time at Marshfield, he founded the Oregon Jazz Band in Coos Bay in 1947, and in 1972 he founded the Sacramento Jubilee Festival, now the largest jazz festival in the world. After spending six years as personnel director for U.S. Plywood Corp. in Roseburg, he was the associate dean at American River College in Sacramento, Calif., from 1964 until retiring to Coos Bay in 1983. He was inducted into the North Bend High School Hall of Fame in 2001 and died earlier this year. Members of the first class of Marshfield's athletic hall of fame, or their family members, sit on the stage set up at the William J. Sweet Memorial Tennis Center Saturday evening. David Walker, standing at the podium, introduced each inductee. World Photo by Lou Sennick. Crabtree won 11 varsity letters, and was a four-year letterman in football and four-year starter in basketball for Marshfield. He was a member of the 1949 junior high state champion and 1953 Marshfield state champion teams coached by Bruce Hoffine and was an all-state halfback on the 1951 and 1952 Marshfield football teams coached by Pete Susick. He was selected most valuable player of the 1953 Shrine All-Star Game. In track and field, he competed in the pole vault, high jump and shot put. After high school, he was a three-year football letterman at the University of Oregon. He was the student body president his senior year at Marshfield and was active in the National Honor Society. He also finished second in the 1953 national Elks Youth Leadership Contest. He has been in the lumber business since graduating from the University of Oregon in 1957. Harris was born in Marshfield in 1942 and earned a football scholarship to Stanford University after playing guard and end for the Pirates. He was drafted by the Los Angeles Rams after his senior year at Stanford, where he excelled at linebacker, and played special teams in the NFL before joining the Army during the Vietnam war. After the war, he returned to a career in engineering, spending a couple years working for Weyerhaeuser in North Bend. He has been married to his wife, Claire, for 27 years and has three children, Aaron, Sunny and Mandy. Hoffine graduated from Marshfield in 1944 after a distinguished athletic career that included being on the 1942 state champion football team and being captain of the 1943-44 basketball team. He played one year of basketball for the University of Oregon before returning to Coos Bay. After three years as a junior high coach, including winning what was recognized as the junior high state championship, he became the high school basketball coach in 1951. He coached for 24 years. In that span, Marshfield went to the state tournament 12 times, including winning the state championship in 1953 and finishing as runner-up three other times. He never had a losing season as coach and was named the Class AAA coach of the year in Oregon in 1974. His overall record was 413-176, a .701 winning percentage. Johnson was a high school all-American in football for Marshfield and later went on to play for Oregon State University and in the Canadian Football League. He graduated from Marshfield in 1957, playing on three state champion teams, and graduated from Oregon State in 1961, where he was an honorable mention all-American. He was drafted by the New York Giants and the Denver Broncos and played three years with the Saskatchewan Roughriders before going into private business. He owns a restaurant in Portland and lives in Oregon City. Merchant was an all-around outstanding track and field athlete who graduated from Marshfield in 1917 and went on to participate in the 1920 and 1924 Olympics. In 1920, he set an intercollegiate record in the hammer throw while participating for the University of California and also set the Pacific Coast Conference record in the broadjump. He was the high-point winner at the Western Olympic Tryouts in California. In 1922, Merchant won two Intercollegiate Athletic Association of America track titles (shot put and hammer throw) helping California win its first NCAA championship in any sport, and was named the "greatest all-around athlete in the United States." He competed in the hammer throw in the 1924 Olympics and appeared ready to qualify for another Olympic team four years later, but had a bad day at the Olympic trials. He stayed involved after his competitive career, officiating local, national and international meets. He died in 1972. Though McSwain didn't grow up in the Bay Area, he became one of Marshfield's biggest boosters. He was born in Enid, Okla., in 1914 and his family became involved in the theater industry. As a student, he earned the rank of Eagle Scout - and had a chance to meet the president. After studying at the University of New Mexico, he went to work in the theater industry. That brought he and his wife, Inez, to Coos Bay in 1949 to operate theaters with his brother, Foster. He became a loyal fan of Marshfield and the University of Oregon and spent many hours at Marshfield practices and games before his death in 1992. Osborn was a three-sport coach for Marshfield in the 1920s and '30s. He graduated from Iowa City High School in 1917 and served as an officer during World War II before coming to Marshfield in 1925 as a history and civics teacher. He coached football, basketball and track and field, and his 1926 football team played Jefferson High School of Portland in the mythical state championship game. Osborn coached at Marshfield until 1938, when he returned to service as an ROTC instructor at Washington State University in preparation for World War II. He returned to Oregon, coaching Corvallis High School to the 1948 state basketball title (beating Marshfield in the semifinals). Smith graduated from Everett High School in 1927 and Washington State College in 1933 before coming to Coos Bay, where he was manager of the Coos Bay Pulp Corp. and later the vice president and West Coast manager of Scott Paper Company. His younger brother, Willis, started the Coos Head Timber Company in 1946 and Wylie joined him in business in 1951. For 45 years, they ran the prosperous business that at one time included three sawmills, a plywood mill, a pulp mill, a shipping dock and a California sales operation. 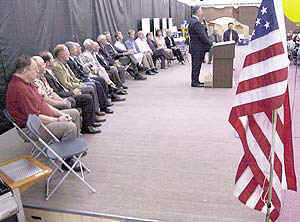 Wylie was active in the Coos Bay Elks Club, a chairman of the Coos Bay School Board and a president of the Rotary Club of Coos Bay-North Bend. His greatest enjoyment was watching his son, Wylie Jr., participate in basketball, football and track and field for Marshfield, and he donated $1 million to the Marshfield football renovation project. Smith died in 1998. Susick had an outstanding football career as a student at North Bend High School and later at the University of Washington, where he led the Huskies in scoring in 1943. He was drafted by Green Bay. However, he is best known for his long coaching career at Marshfield. He led the Pirate football team to two state titles and a co-championship in the three-year span from 1954 to 1956 and also had two state runners-up and eight other playoff teams in his career, which spanned 1946 to 1979. He finished with an overall record of 235-69-18 and the school's football stadium now bears his name. He was named Hayward Champion of Champions in 1955, recognized by the Oregon Sportswriters and Broadcasters in 1956, named coach of the year by the Oregon Journal in 1968 and named football coach of the year by the 8th District in the United States in 1979. He received the Bill Hayward Banquet Merit Award the year he retired and was inducted into the Oregon State Hall of Fame in 1994. 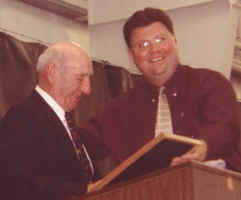 He was the winningest high school football coach in Oregon history and was inducted into the North Bend High School Hall of Fame in 2000. Susick still regularly attends Marshfield sporting events. Widely recognized as one of Marshfield's biggest fans, Williams has been a member of the Marshfield Booster Club for more than 50 years. He was born in Platteville, Colo., in 1918 and participated in basketball, track and field and softball at Collins High School. After studying at Colorado State University, he moved to Klamath Falls, where he met his wife, Ruby. They were married for 62 years, until her death in 2002, and moved to Marshfield in 1940. Buck joined the U.S. Air Force during World War II, but returned to Coos Bay to work for Sunset Music Company. His three sons, Jim, Jerry and Randy, all graduated from Marshfield and Oregon State University. He was a past president of the Marshfield Quarterback Club (the previous name for the Booster Club) and a golf tournament fund-raiser in his name is held every fall.